1. Cocobolo Double diamond flat bottom grips. 2. 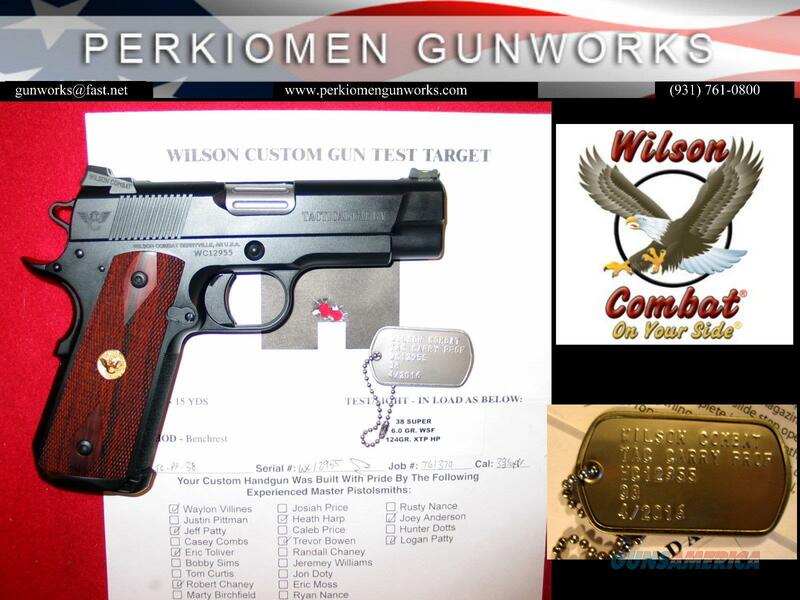 Wilson Combat GOLD grip medallions. 3. Green Fiber Optic front sight. Complete with Wilson pistol rug, manuals, cleaning cloth, lock, 3 Wilson Combat 9+1 mags, Dog Tag w/serial # and test target. +Insured S&H of $40.00 to your local FFL dealer for transfer. Alaska, Hawaii and Puerto Rico add $20.00 for a long gun as they have to be mailed – handguns are not extra. **Note: This gun (and all our guns) is IN STOCK, our price is fair and firm. We know it’s not the lowest price BUT this is the gun you are buying – we don’t give you a discount lower price and then put it on order!!! To pay on line - go to perkiomengunworks.com - find item - put in your cart and check-out. All credit card transactions on this site will be charged a +3% non-cash or check maintenance fee. We will receive notice of your payment automatically. Then all we will need is for you to have your local transfer dealer fax, email or mail their FFL license copy to ship firearm.